What are perfluoroalkyl substances (PFAS)? In 2016, the USEPA issued a drinking water health advisory for perfluorooctanoic acid (PFOA) and perfluorooctane sulfonate (PFOS), which are part of a class of substances called perfluoroalkyl substances (PFAS). These compounds have recently received increased regulatory scrutiny, as well as media coverage. PFOA and PFOS were commonly added to fabrics and packaging to improve stain resistance. In addition, PFOA and PFOS were components of foams used for fire suppression, particularly at civilian and military airfields. These compounds have been recently identified in some drinking water sources, which has generated understandable public concern. What are sources of PFAS in the environment? Cleanups involving PFAS are generally centered around airfields (where they are a component found in fire suppression foams), landfills which may have accepted wastes containing PFAS, and facilities that may have used PFAS to provide stain resistance to textiles. 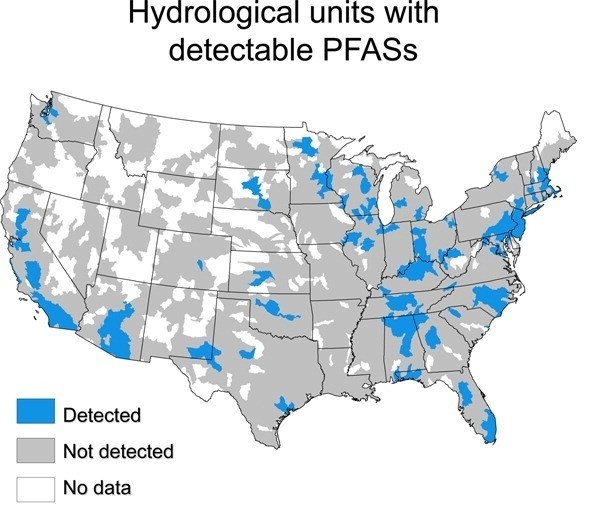 A paper published in Environmental Science and Technology (Hu, et al 2016)  presents known hydrological units where PFASs have been detected in the lower 48 states. These hydrological units appear widespread, but generally appear close to well-populated areas. PFAS are resistant to degradation and have been in widespread use for over 60 years. USEPA reports that peer-reviewed studies suggest that developmental effects may occur in fetuses or breastfed infants, and that cancer, liver effects, and decreased immunity may also occur at adverse concentrations. In November 2017, California’s Office of Environmental Health Hazard Assessment (OEHHA) added PFOA and PFOS to the list of chemicals known to the state to cause reproductive toxicity, which triggers certain requirements under Proposition 65. In January 2018, the state of Michigan established enforceable cleanup criteria that mirror the 70 ppt USEPA health advisory level (which is unenforceable). The state of Michigan recently used these new enforceable criteria to sue an in-state tannery accused of impacting a local drinking water source. Pay particular attention to proximity to airfields that may have used PFASs or landfills that may have accepted PFAS-containing wastes. Given the recent, emergent awareness about PFASs, previous investigations may not have sampled for PFASs. Consequently, PFASs may represent a possible re-opener for “closed” sites with existing NFA letters. For water-intensive industries, investigate whether PFAS-related sources may be nearby. In a stock acquisition, evaluate whether the target company may have disposed of wastes at a landfill that may have also accepted PFAS wastes.